This chapter provides a broad survey of virtual museums and their developments in a range of contexts from various parts of the world. The focus is on exploring virtual museum platforms and features designed for different purposes and practices, and the prospect of the potential in such virtual environments to meet specific needs in varied contexts. Attention is given particularly to the growing work in Asia, namely, China, Taiwan, Japan, Hong Kong, Thailand and Singapore, which is fast developing, given the rapid technological advancements in the field. Of specific interest are the underlying principles and theoretical perspectives driving studies mediated through digital technologies in various museum settings. Technologically-mediated platforms examined range from Web-based comprising basic text to more complex interactive features, mobile, 3D immersive virtual reality to augmented reality environments with different levels of interactivity and engagement. The pedagogical implications of virtual museum contexts are considered with potential research directions recommended in the growing field of new learning environments in the 21st century. A museum, as defined according to the International Museum Council (2007), is a ‘non-profit, permanent institution in the service of society and its development, open to the public, which acquires, conserves, researches, communicates and exhibits the tangible and intangible heritage of humanity and its environment for the purposes of education, study and enjoyment’(ICOM Statutes, 2007, art.3, ¶1). Museums ‘present objects layered with information and encourage examination, analysis and questioning’, teach the skills of ‘visual learning and critical thinking-the skills that develop lifetime learners’ and ‘invite purposeful use and forge links to the world beyond their walls’ (Sheppard, 2002, p.32). As rich storehouses of cultural heritage practices in visual and material culture, museums play a key role in the promotion of international understanding and cultural exchange. A virtual museum takes this one step further as a museum that exists online with a collection of electronic artifacts and resources in a digitized form. This may include items such as photographs, paintings, drawings, diagrams, audio recordings, video segments, articles and interview transcripts. Virtual museums can be created using basic applications like Microsoft Word, Powerpoint, or web page software. Digital creation of art could be achieved through software such as Net art, Virtual Reality and Digital art with the Internet-based platform displaying digital representations of collections. Various terms have been used interchangeably with ‘virtual’ museum - online, electronic, digital, cyber, web, and hyper-museum. The term used depends upon the background and orientation of the researchers and practitioners working in the field. 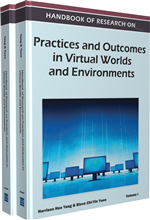 For purposes of this chapter, the term ‘virtual’ is used in a general sense to refer to various types; specific elaboration of the defining characteristics for particular categories, where relevant, will be unpacked in subsequent sections. Virtual museums are seen to overcome the limitations of traditional methods of displaying and organizing information in museums. Virtual museums can serve to unlock the semiotic potential of multimodality in promoting attention to meaning through sound, music, image, movement and text with a focus on writing as a multisemiotic resource (Kenner, 2004) to construct meaning and project identities. Multimodal pedagogy is recognized to enable ‘the assertion of student identity, cultural practices and community to enter the school context’ (Stein, 2003 in Jewitt, 2008, p. 250) in ways that impact literacy and teaching. It involves participants in the ‘design of meaning’ (New London Group, 1996), with ‘design’ here referring to ‘how people make use of the resources that are available at a given moment in a specific communicational environment to realize their interests as sign makers’ (Jewitt, 2008, p.253; cf. Kress, 2003). The focus is on individual agency and empowerment in the process of designing meaning since, as Van Kraayenoord and Paris (2002) remind us, the creation, selection and interpretation of an object are all personal choices (p.230) and ‘not neutral’ (p. 224) acts.